Enjoy this easy, 6-ingredient, healthy recipe. Salmon is low in sodium. 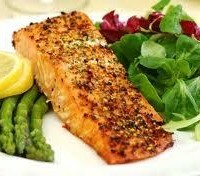 It is a very good source of Protein, Vitamin B12 and Omega-3 fats. Omega-3 fats seem to primarily work through reducing inflammation in our bodies. Inflammation is turning out to be at the base of many health problems, including heart disease, diabetes, some types of cancers and arthritis. Omega-3’s also help prevent the blood clots which cause many strokes. This recipe also includes pistachios. Pistachios are an excellent source of vitamin B6, copper and manganese; important vitamins and minerals for the body. The little nut also provides potassium and is a good source of phophorus and magnesium. Preheat oven to 375 degrees. Line a baking sheet with parchment paper and set aside. In a small bowl, mix together the pistachios, cilantro, salt, pepper, lemon zest, and lemon juice. Put the salmon fillet on the baking sheet and top with the pistachio mixture. 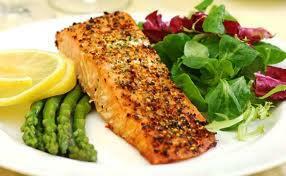 Use your hand or the back of spoon to evenly distribute the mixture across the salmon fillet. Bake in the preheated oven for 8-15 minutes, depending on the thickness of your fish. Definitely check it after 8 minutes–you don’t want a dry fillet! When the salmon easily flakes off with a fork, it is ready. Enjoy!